A new species of a tiny, colourful bird has been found by Irish scientists in a small under-explored island chain in the tropics. 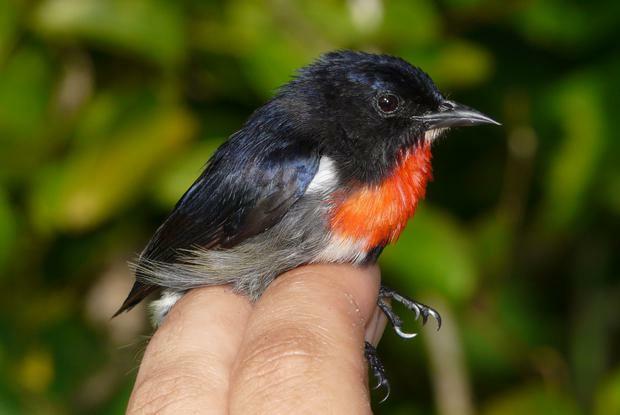 Zoologists from Trinity College Dublin named the new find the Wakatobi Flowerpecker (Dicaeum kuehni) after identifying it on numerous expeditions to the biodiversity hotspot of Sulawesi, Indonesia. Sean Kelly, PhD student at Trinity and lead author of the study confirming the discovery, warned that the pace of development in the region could wipe out other undocumented creatures before they are identified. "As humans are changing the natural environments of Sulawesi at an incredibly fast rate, the discovery and description of species in the region is of major importance," he said. "This study also highlights the need for integrative, multi-disciplinary research in the region. "Without this we will likely fail to recognise and appreciate the true biodiversity of this remarkable region. Furthermore, we run the risk of losing evolutionarily distinct species before we can even discover or enjoy them." The Wakatobi flowerpecker is genetically distinct and substantially larger than its closest relative, the grey sided flowerpecker, which it does not mix or breed with. The studies also showed that it does not cross a 27km stretch of sea where its neighbour lives. The region where the discovery was made, the Wakatobi islands in south-east Sulawesi, was made famous in science circles by one of the forgotten fathers of modern science, Alfred Russel Wallace. He independently conceived the idea of evolution by natural selection in the 1850s. Some of his work was published alongside writings by his more famous contemporary Charles Darwin before the groundbreaking Origin Of The Species went to print. Despite boasting an incredibly large number of bird species that are found nowhere else in the world, the Sulawesi region has remained poorly studied. Scientists now believe that the lack of research and genetic analyses on similar birds has meant that the number of species on the relatively under-explored islands has been significantly underestimated. The findings of this latest zoological discovery have been published in the journal PLOS ONE. Dr Nicola Marples, associate professor of zoology at Trinity and senior author on the paper, said the protection status of the Wakatobi islands must be reassessed following the discovery. "While the islands sit within the Wakatobi Marine National Park, they currently receive no protection. The Wakatobi Islands are an incredibly exciting place to work and they serve as a unique living laboratory in which we can study evolution in action," she said. There are many different varieties of the flowerpecker across the tropics with the spectacled flowerpecker also a separate species and only identified in Borneo in 2009.